Last week, I invoked the literal spirit of Will Rogers to deal with the insanity that seemed to be sweeping our nation’s capital. As I begin writing this week, it’s starting to appear that some sanity is returning. That’s something we’ll be drinking to this week, with a genuine antique that’s approved of by many of the cocktail cognoscenti. I just wish I loved this one a bit more than I do. I, therefore, have no way of knowing if the woman who accompanies many of my dinners — and whose old Air America radio show helped me to discover the classic cocktail spirit — introduced some twist in her preparation which made the drink sing a bit more for her and Fallon than it does for me. The version I’ve been making is worth is worth a try even if I didn’t love it to death. Combine your ingredients in a cocktail shaker or mixing glass, stir fairly vigorously, and strain into a chilled cocktail glass. This week, let’s consider a toast to pure, sweet sanity as we down this complex semi-treat. The key ingredient in today’s drink is Chartreuse, also called Green Chartreuse to distinguish it from the milder Yellow Chartreuse. First featured here in star bartender Julie Reiner’s Shamrock Sour, this 110 proof liqueur beloved of cocktail aficionados and, apparently, Quentin Tarantino, is a prime example of a little going a long way. It’s a very herbal, very sweet, and very complex little bugger and gin doesn’t really stand a chance against it. 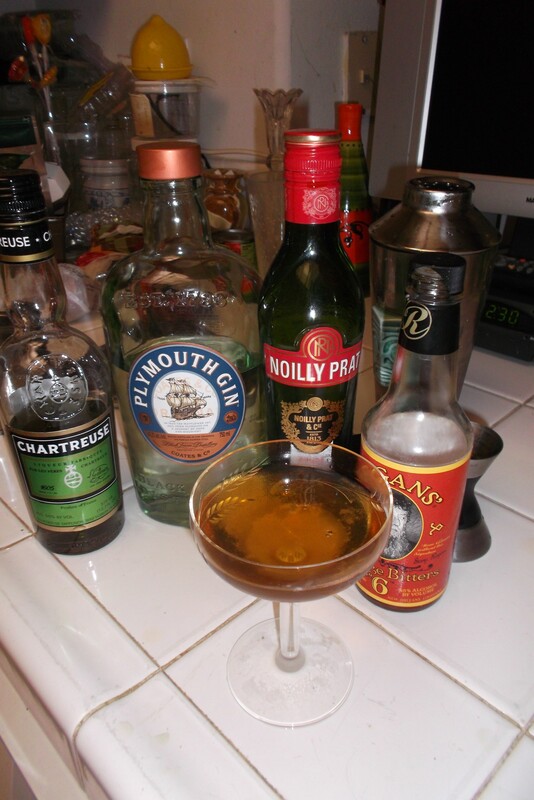 Since this is one of the 23 recipes in the Savoy book specifically calling for Plymouth Gin, I tried it that way a couple of times. Most recipes, however, call for the usual London style gin. I used Bombay Dry, which is what I have on hand these days, and I found it a bit crisper and more brash that way. Really, though, I liked the drink about the same with both gins. You may want to experiment with various garnishes. I tried a cheap maraschino cheery once, which didn’t hurt. Rightly renowned cocktail guru Robert Hess, who is obsessed with presentation to a point I tend to disagree with, calls for an elaborate orange peel, which does look pretty and probably wouldn’t hurt the flavor. I do have to reluctantly admit, however, that this drink really doesn’t benefit from shaking. Don’t ask me why, though I’ll never buy Hess’s argument that “clouding” drinks with ice crystals by shaking them is some kind of cocktail fate-worse-than-death. Hess is also one of many to point out the word “bijou” means jewel in French, which to him means the drink is supposed to look jewel-like and, yes, be completely unclouded. Movie geek that I am, I associate the term with the frequent name for old theaters. Despite being namesakes, Robert Hess and I clearly don’t think that much alike, though he is absolutely correct when he adds the Bijou is extremely Chartreuse forward. Some things really are kind of inarguable.Up is not down and day is not night though, as we’ve all learned, you can stop some people from claiming just that. I don’t know about you, but after everything we’ve been through, I could use a drink, any drink.